Rampion features 116 3.45 megawatt (MW) turbines that each sit on top of a specially design foundation fixed to the seabed. 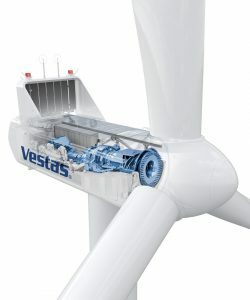 The turbines comprise an 80m tall tower, a nacelle for the generation equipment, a hub, and three 55m long blades. When vertical, the tip of the turbine blade reaches 140m, which is slightly higher than the peak height of the Brighton i360’s viewing pod. 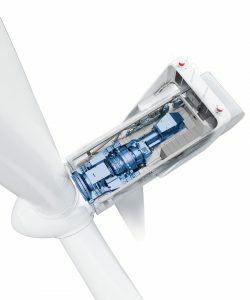 In total the rotor diameter is 112 metres. They are installed in 12 strings, or rows, each with 9 to 10 turbines connected by array cables that join in to the single offshore substation. The closest wind turbine to shore is 13km (8 miles) and the farthest is 20km (12.5 miles) away. The towers weigh 167 tons, are 64 metres tall with a diameter of 5 metres. Each blade weight 12 tons and is almost 55m long. The wind turbines start generating electricity at wind speeds of around 3 metres per second (m/s) or approximately 7 miles per hour and generate maximum rated power (reach full capacity), at 12 m/s. They cut out when wind speeds reach 25.5 m/s, or around 50 miles per hour, to prevent damage from the gale force winds. Each foundation comprises a monopile and transition piece to support the turbine tower and include boat landings, cranes, ladders and platforms for access. Rampion has two export cables stretching 16 km from the offshore substation to shore. They were installed by cable installation vessel Stemat Spirit.